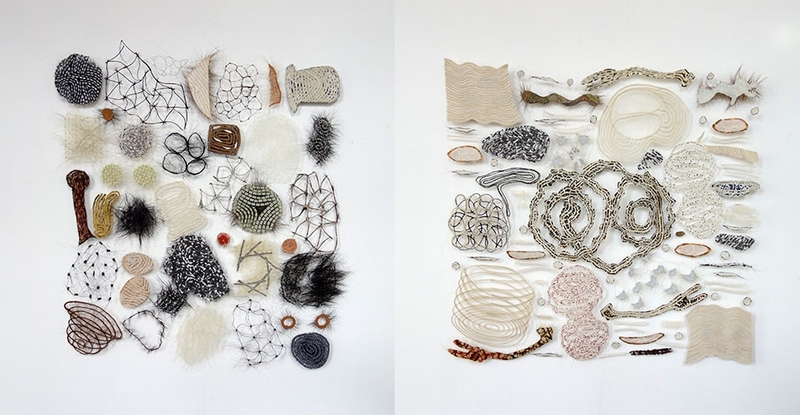 Marian Bijlenga, a Dutch contemporary artist, approaches mark-making with an innovative use of materials as a drawn “line.” Her unique constructions respond to the environment, echoing her interpretations of interconnected webs of fiber. Drawing on a non-traditional use of the sewing machine, these sculptures are mere whispers of dark and light, playing on positive and negative spaces, sometimes barely visible gestures as a shadowy effect. Bijlenga’s work is collected internationally and represented in the U.S. at LongHouse Reserve in East Hampton, New York and The Museum of Arts & Design in New York City. Her work is in the collection of the Craft Museum of Finland and in the Netherlands, at the Stedelijk Museum in Amsterdam, CODA Museum in Apeldoorn, and TextileMuseum in Tilburg. Most recently, she was the winner of the Grand Prix of Bozena Augustinova award at the 5th Triennial Textile Art of Today exhibition at the Danubiana Meulensteen Art Museum in Bratislava, Slovakia. I am fascinated by dots, lines and contours, by their rhythmical movements but also by the empty space they confine. Instead of drawing on paper, I draw in space by using textile as a material. I work with thread, fabric and horsehair, materials which are soft, light, flexible and open to endless development. The suppleness of textiles gives me the greatest possible freedom to achieve my goal: the discovery of new forms. For me transparency is a prerequisite. By leaving some space between the structure and the wall the object is freed from its background and interacts with the white wall. It becomes what I call a “Spatial Drawing”. Special thanks to Judy Pyle and Wayne Pitluck for their support.